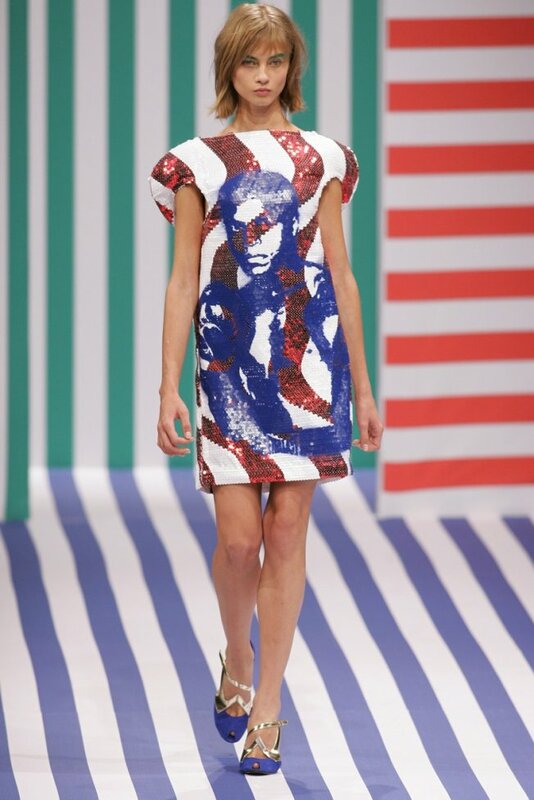 One dress paid homage to Muhammad Ali in the Jean-Charles de Castelbajac Spring/Summer 2008 Show, named « Sportacus ». Furthermore, Muhammad Ali starred, with his grandson, in Louis Vuitton’s Annie Leibovitz-shot « Core Values » campaign, which was unveiled on June 15, 2012. Man Ray’s photographic tribute to Jean-Auguste-Dominique Ingres, « Ingres’s Violin / Le Violon d’Ingres », was referenced in the Jean-Charles de Castelbajac Autumn/Winter 2011-2012 Show, titled « Woman / Ray ». Some Jean-Auguste-Dominique Ingres-inspired collections : BodyAmr Autumn/Winter 2011-2012 (this collection paid homage to Jean-Auguste-Dominique Ingres’s « The Big Odalisque / La Grande Odalisque » painting), Elisabeth de Senneville Spring/Summer 1989 (this collection featured printed images which reproduced Jean-Auguste-Dominique Ingres’s « The Turkish Bath / Le Bain turc » work), Maryam Keyhani Autumn/Winter 2011-2012 (for this collection, which honored Jean-Auguste-Dominique Ingres’s color palette, Maryam Keyhani started sketching on top of the neoclassical painter’s portraits), Pleats Please by Issey Miyake Autumn/Winter 1996-1997 (the N° 1 « Guest Artist Series », in collaboration with Yasumasa Morimura, featured prints that were based on Yasumasa Morimura’s photographs, which were originally influenced by Jean-Auguste-Dominique Ingres’s « Odalisque » artwork). To read about other Man Ray-inspired collections, search for the « Man Ray » post that I have published on July 6, 2012. One dress in the Jean-Charles de Castelbajac Spring/Summer 2008 Show, titled « Sportacus », paid tribute to Elizabeth Taylor in Joseph L. Mankiewicz’s « Cleopatra ». 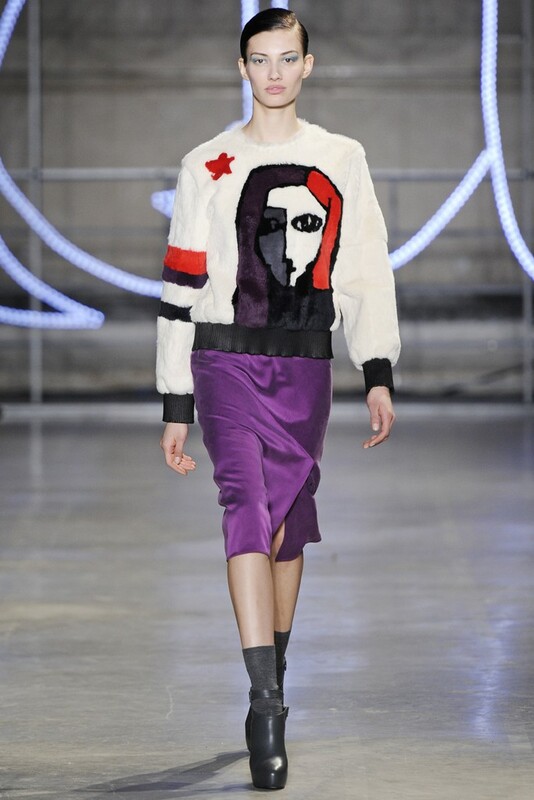 Other « Cleopatra »-inspired items : Topshop Unique Spring/Summer 2012 (portraits of Elizabeth Taylor in « Cleopatra » were reproduced on the sweater and on the T-shirt of the 35th and 36th looks, and on the invitation for this show, whose theme was « ancient Egypt meets ’90s urban hip-hop scene »). 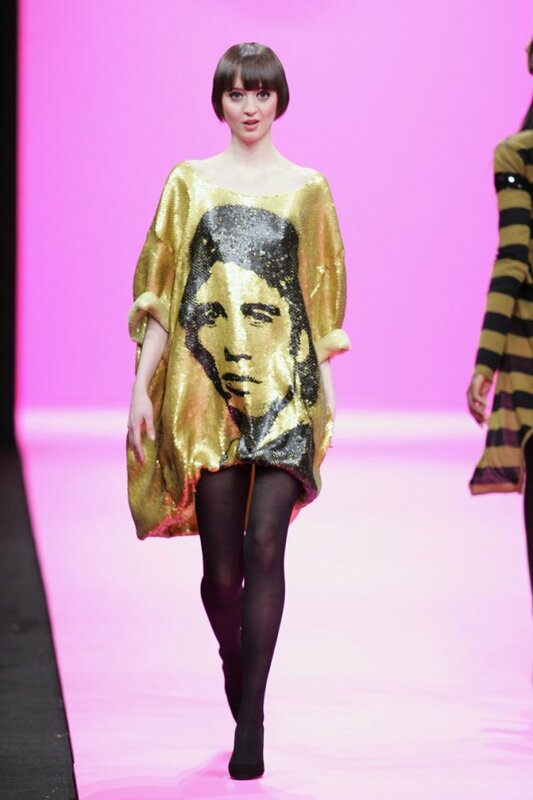 One dress paid tribute to John Travolta in John Badham’s « Saturday Night Fever » in the Jean-Charles de Castelbajac Autumn/Winter 2007-2008 Show. Another « Saturday Night Fever »-inspired outfit : A.W.A.K.E. by Natalia Alaverdian Spring/Summer 2013 (this collection featured a 3-piece white canvas suit that was, according to Natalia Alaverdian, « very Saturday Night Fever »).